B12 is a cloud-based business website builder which uses artificial intelligence (AI) and human designers to create custom websites for brands. B12 aims to provide their customers with more time for building their business, rather than their website, and therefore builds websites for them, whilst also offering tools for customization. Suitable for any kind of business, from immigration law to holistic medicine, B12’s human-assisted AI tool learns about business needs and creates a custom website prototype in 60 seconds. B12 combines the strengths of technology and human design experts to build branded, customized websites. After clients answer a few questions, the A.I. technology generates a prototype website in 60 seconds. Armed with client feedback, a team of vetted designers transforms this draft into a fully functioning online website in less than a week. 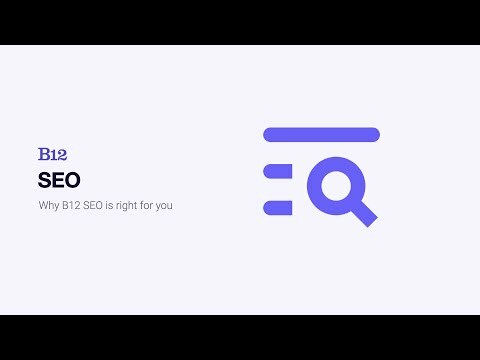 Each month, B12 delivers personalized recommendations to users to ensure that websites remain up-to-date with technological advances and trends. AI can automate and process data, but it can’t think creatively or deal with ambiguity. B12 combines both human designers and AI to create tailored websites for clients. Businesses can then use the design suite to make changes to their website, with tools such as a drag and drop editor, a choice of pre-built page themes, content editing, link embedding, and more. The design suite also allows businesses to edit colors, themes, layouts, images, videos, text, and more, to create a fully customized website. Software by Unlimited Labs Inc.
B12 was able to deliver a multi-page, interactive website that gave us a dramatic upgrade with low start-up cost. They were able to provide our new site with color, movement, and ways to connect with our customers through links, forms, & testimonials. The whole process was quick ( a couple weeks) and they worked with all the adjustments needed to get just the right balance of color, white space, and images. We had a couple extra hurdles in the transition, and Mac was great at keeping up communication with us throughout the whole process. We love our new site as we feel it gives a great first impression. We can't wait to keep adding to it!My favorite is the Events and Testimonials page. The Events can add pics and live links, the text can be formatted The Testimonials page includes a form for customers to submit their own before/afters to us, while allowing us to add and maneuver those testimonials however we wish on the page WITH pictures! and full-size too, not just the thumbnail size. The movement of the carousel of quotes on the Home page is also a favorite feature. I feel these two pages is what really makes our website stand out. My favorite is the Events and Testimonials page. The Events can add pics and live links, the text can be formatted The Testimonials page includes a form for customers to submit their own before/afters to us, while allowing us to add and maneuver those testimonials however we wish on the page WITH pictures! and full-size too, not just the thumbnail size. The movement of the carousel of quotes on the Home page is also a favorite feature. I feel these two pages is what really makes our website stand out. I love to tweak my website but I overdo it. I needed a real designer. Now my site looks professionally designed yet personalized. Now I can feel confident promoting my business on my new site.B12 is amazing for getting a website up immediately. I mean in minutes! It uses smart AI technology plus they have actual people that will help you customize the design and to make changes. I've been using a dyi for 10 years. With B12 I enjoyed the ability to just 'set it and forget it'! Perfect for projects that you don't want to invest a lot of time with, or clients on a budget. You can still go back in and muck around with changes if you like. The best customer service anywhere! Seriously, look into this! B12 is amazing for getting a website up immediately. I mean in minutes! It uses smart AI technology plus they have actual people that will help you customize the design and to make changes. I've been using a dyi for 10 years. With B12 I enjoyed the ability to just 'set it and forget it'! Perfect for projects that you don't want to invest a lot of time with, or clients on a budget. You can still go back in and muck around with changes if you like. The best customer service anywhere! Seriously, look into this! I would like to make some changes more easily myself, a little more WYSIWYG, like add a pic her, resize a text field there, but it's not really their model. If I make too many changes to the style myself I end up with muck, so I needed an actual designer. Great experienceB12 is what entrepreneurs of small business like me were waiting today. Machine learning + educated humans turns building a website into a big pleasure. I made an amazing website only in 1 day and got SEO included for a very small price. CSR from B12 is amazing! He helped me to overcome some difficult issues over the phone and additionally walked me through other 3d party services which are not included in B12 to improve my website functionality. Definitely would suggest this platform for everyone and will launch couple more websites soon. Thank you again B12 and thank you Dan! B12 is what entrepreneurs of small business like me were waiting today. Machine learning + educated humans turns building a website into a big pleasure. I made an amazing website only in 1 day and got SEO included for a very small price. CSR from B12 is amazing! He helped me to overcome some difficult issues over the phone and additionally walked me through other 3d party services which are not included in B12 to improve my website functionality. Definitely would suggest this platform for everyone and will launch couple more websites soon. Thank you again B12 and thank you Dan! We had a very dated website with low information and visuals, it was more of a placeholder. With the effort and insight from B12, they were able to execute a new website for us that's especially​ pleasing and able to drive new business. It was great working with our account rep who was able to articulate what was working and what wasn't to the design team.The ease of use, the suite is quite intuitive. There have been a few times where we needed help from B12, and they've been more than accommodating. The work they did initially with the layout, coding, and copyrighting for our new site allowed us to come in and tweak to our liking. The ease of use, the suite is quite intuitive. There have been a few times where we needed help from B12, and they've been more than accommodating. The work they did initially with the layout, coding, and copyrighting for our new site allowed us to come in and tweak to our liking. The editing capabilities for photos would be great if there was a sizing chart so we had guidelines​ for image sizes. Overall, I would highly recommend B12 for those who are on a budget. I was a little worried at first because it took a few days longer than what I anticipated to receive the first draft of my website. However, when I heard back from them, I was satisfied. There were a few tweaks to be made, but they followed through and responded to my requests.The software is very easy to use. Although I'm not a web designer, I was able to go in and make changes to my website without assistance. The software is very easy to use. Although I'm not a web designer, I was able to go in and make changes to my website without assistance. The design was awesome, but I wish I could have had more input into what photos should go on my website. Get Started: For businesses looking to launch on their own. Get Online: $29/month with custom domain, unlimited traffic and bandwidth, secure hosting, unlimited file storage, priority design customization, 2 hours of free design time from B12 Design Experts, monthly website recommendations, and chat & priority email support. Get Integrated: $59/month. Includes all the features of Get Online plus phone support and third party integrations. Get Found: $99/month Includes all the features of Get Integrated plus search engine optimization tools (SEO). Get Found Pro: $249/month Includes all the features of Get Found plus a monthly blog post (for SEO) and monthly social media posts. Custom: Need a custom-built website? Contact B12 for more information. Human-assisted AI: Artificial intelligence automates the tedious parts of web design, while B12’s experts focus on UX and aesthetic. Businesses can then use the design suite to edit the website further, add custom images and videos, personalize content, and more. Industry-specific design: Each B12 website is customized for the businesses individual practice and clients. B12 crawls the web and collects data on businesses to help create the website. Content designed for click through: Relevant content ensures leads engage and convert. B12 offers starter copy and an image archive which are tailored to different industries. Responsive design : B12 websites are optimized for desktop, mobile, and tablet. Reach target clients and provide a top-notch user experience on all devices. Ongoing Optimization : As a firm grows, their website needs to grow, too. B12 provide monthly recommendations from expert designers and developers in order to help businesses stay up-to-date with technology. Below are some frequently asked questions for B12. Q. What type of pricing plans does B12 offer? Q. Who are the typical users of B12? Q. What languages does B12 support? Q. Does B12 support mobile devices? Q. Does B12 offer an API? No, B12 does not have an API available. Q. What other apps does B12 integrate with? Q. What level of support does B12 offer?